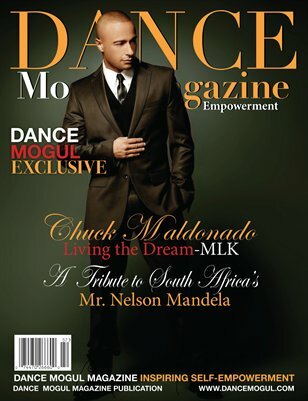 Dance Mogul Magazine presents this special tribute to Mr. Nelson Mandela that features choreographer Chuck Maldonado. You may have seen Chucks work on, So You Think You Can Dance, America's Best Dance Crew, XFactor and more. He has worked with artist such as PDiddy, Neyo, Fergie, Omarion, MissyElliot, Kanye West, Usher, Ludacriss, and Pink. Chuck Maldonado choreographed all the promotional videos for the Disney Movies and GForce (2009). He was Honored at the 2008 "Choreographers Media Honors Awards" for his work in Chris Brown's 2007 Performance at the Grammy's, 2007 NAACP, Image Awards for Artistic Direction, and Choreography, Brighthouse Network Commercial, and Best Movie in 2007 Stomp The Yard. Chuck Choreographed and danced in over 15 major movies, numerous commercials, countless TV sitcoms, and award shows that grossed MILLIONS of DOLLARS and growing. He has been in over 25 Billboard Top 200 artist videos. Chuck is also a member of KappaAlphaPsi Fraternity Incorporated.